Welcome to another helping of wee-views! These are ‘wee reviews’ of games that I didn’t get round to completing, but did play enough to have formed a fairly solid opinion. Please do bear in mind, then, that each of these games could end up getting better or worse as you progress further in them. For a more detailed explanation of the thought process behind wee-views, check out the original wee-view page. A number of years ago I was hopelessly addicted to New Star Soccer, a mobile game in which you played as a young up-and-coming footballer. New Star Manager is its follow-up, and having previously been released on mobiles as New Star Soccer Manager it’s now made a high-profile transfer to the Switch, ditching its controversial microtransactions along the way (as well as the word ‘Soccer’ from its title for some reason). And it’s just as bloody addictive as its predecessor was. This time, as the name suggests, you aren’t in charge of a single player but the manager of an entire team. As well as buying and selling players, figuring out formations and assigning team tactics, you also need to keep players happy, take part in press conferences and upgrade your team’s facilities (from the training ground and scouting system to the actual stadium itself). Best of all, though, is the actual match process itself. 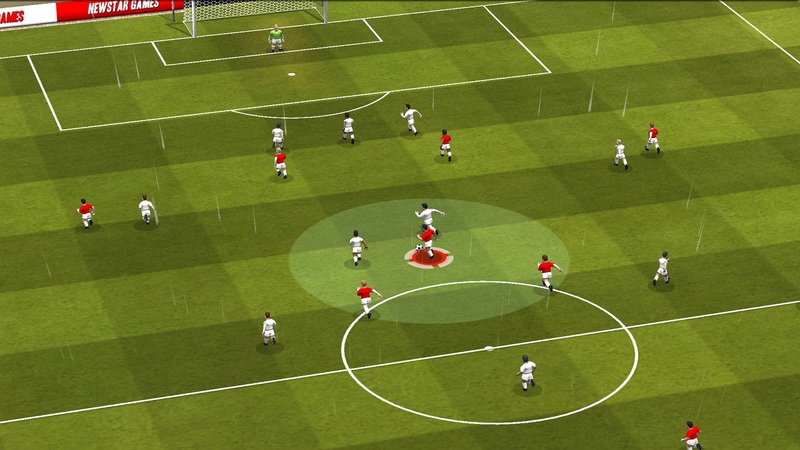 At first glance it’s similar to Football Manager, with text commentary appearing as the game progresses at high speed. When it comes to highlights though, things change. When there’s an important moment, Football Manager cuts to a view of the pitch so you can see it playing out in front of you. New Star Manager goes one better by letting you actually take control of these moments. Here you can pass to players’ feet, pass to space instead, create player runs or just go off on a dribble if you feel like it, all with the hopeful aim of getting a shot on goal. It’s essentially a player-manager game, then, and it’s extremely moreish, but that’s not to say it isn’t without its setbacks. Every player name in the game is completely fictional – so you can’t go wandering into the transfer marked armed with a list of real-life players you want to sign – and you have to start off as a brand new team in the bottom division of the country you choose (meaning I couldn’t manage Celtic). It was also originally designed with touch screens in mind, and while you can use the Switch’s touchscreen in handheld mode, if you’re using the JoyCon or Pro Controller it can take a wee while to get used to the button-based interface. You do get it eventually, though. That aside, this is exactly the sort of game that’s going to have me losing a lot of sleep in the future, because I haven’t played anything with such a strong “one more game” feeling in a while and I’m already obsessed with it. So yeah, thanks a lot, New Star Manager. We’re now at the stage that you can’t turn around without bumping your head into a Metroidvania game: it’s fair to say the genre is becoming massively oversaturated. I can safely say that of all the indie Metroidvanias I’ve played in the last five years, Omega Strike is definitely one of them. Its gimmick is that you can switch between three characters (eventually, once you rescue the other two). One of them can push blocks, one of them can roll Morph Ball style through tunnels, and one has a double-jump. Cue your usual Metroidvania routine where certain areas can only be accessed once you’ve got the right character, or their specific upgrades. Nothing about Omega Strike offended me in any way: it looks nice enough in a Metal Slug sort of way, its music is pleasant enough and there’s nothing about the way it plays that feels particularly broken or clunky. Its checkpointing system is generous enough, its boss fights aren’t cheap and it’s just a half-decent game all round. But it just doesn’t have that spark that makes it stand out among the countless other Metroidvanias that also perform adequately. So, if you can afford Omega Strike and you like this sort of thing, then you might as well get it because it’s fine, it works, it’s fun enough and it meets a need. The original Pang, also known as Buster Bros, was released way back in 1989. Since then there have been a bunch of sequels and remakes, most of which have just been alright. It’s also worth bearing in mind that the DS one was called Pang: Magical Michael, which is maybe the worst game name ever. Regardless, Pang Adventures is the latest edition. It first came to the PS4, Xbox One and PC a few years back, and now it’s made the trip to Switch like so many other smaller current-gen games looking for a second chance at glory. To be fair, this one deserves it to an extent because it’s probably the best version of Pang to date. It goes for a ‘world tour’ theme, meaning your role is to fly around the planet, visiting various locations and using your harpoon gun to destroy all the killer balloons floating around. In typical Pang fashion, each time you destroy a balloon it splits into two smaller balloons, meaning there’s a light element of strategy here: if you go guns-a-blazing right away and destroy all the big balloons, you could end up with a sea of tiny, hard-to-hit ones resulting in your inevitable death (it’s one-touch kills in this one). Oddly though, the best thing about the game is the fact that it gives you infinite lives, something the previous ‘80s and ‘90s Pang games didn’t do. It may seem strange to praise a game for offering less of a challenge, but by its very nature Pang can be pretty difficult when you’ve got loads of bubbles bouncing all over the place. It’s not like having endless lives means you can soar through it: when you die you start the level from the beginning, so you still have to beat each stage cleanly without taking a hit. It just means you a least have a chance of seeing the later stages, whereas in the past when you reached a particularly tricky one you that was probably where you’d lose all your lives, get Game Over and have to start again. Pang has always been a series I’ve played for 10 minutes or so before bailing when it started getting annoying, but this one? This one I like. 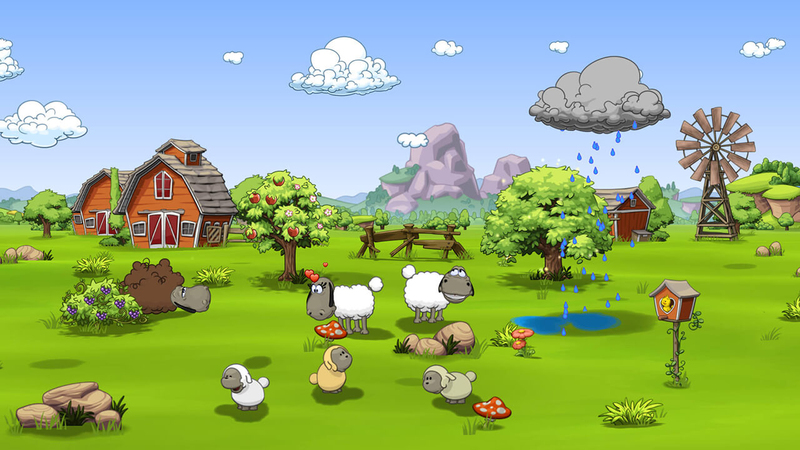 Another game that was originally released on mobile, Clouds & Sheep 2 hit iOS and Android about three and a half years ago and now it’s on Switch. Starting off with a single sheep in a small field, the aim is to eventually increase the former in number and the latter in size so you end up with the sort of bustling sheep paradise that would have farmers soiling their slacks in excitement. To do this you have to perform a series of tasks and fulfil your sheep’s needs (not like that, you pervert) in order to make sure they’re happy. Get two sheep to fall in love and a baby sheep will turn up, continuing the circle of life and no doubt making Elton John shed a tear. One gimmick is the ability to control the clouds, hence the title: if you combine enough clouds together you can create either a rain cloud or thunder cloud to water things or destroy objects respectively. It looks nice enough and the music is pleasant (if repetitive), but by a mere two hours in I already felt I was done with it. It can often be annoying waiting for certain resources to build, and even though there are loads of objects and pieces of scenery you can work towards affording and placing in your field, I really couldn’t muster up the enthusiasm. Although it isn’t identical, I had more fun playing New Frontier Days, which is a similar mobile-based resource management game. I have no doubt that Clouds & Sheep 2 will appeal to some who are fans of this genre. It just didn’t click with me. Ever since the cult success of Towerfall, countless indie developers have been trying to strike gold with a new multiplayer party game to replace it. This isn’t it, but it isn’t terrible. It’s a retro-themed one-hit-kills jousting game, where the aim is to win each round by hitting your opponent before they hit you. Each character can fly around in any direction, but the twist is that there are three distinct weapon types, each with their own strengths and weaknesses. Straight swords and lances are the easiest to use – because you simply fly into your opponent to beat them – but they have the shortest range. 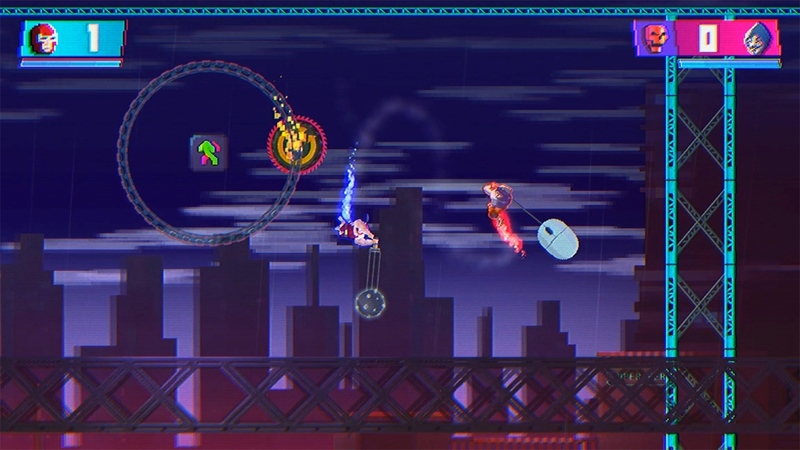 Spinning weapons (like a ball and chain, or mouse and cable if you’re playing as the ‘Anonymous’ keyboard warrior) have a longer range, but also require a lot more skill because you have to swing them around manually, using the game’s momentum and physics. Meanwhile, projectile weapons (guns, arrows and the like) obviously have a much longer range, but also have a short pause between shots, meaning if you miss you’re exposed to attack for a while. In theory this sounds like it could be rife with strategic possibilities, but in reality it isn’t very well-balanced. The spinning weapons require too much skill and the long-range weapons aren’t accurate enough to justify their slow reloading, meaning characters with swords are almost always the best option. It does try to keep things interesting with power-ups and a few single-player modes (like a level-based ‘arcade’ mode and a series of challenges), but its imbalance means it’s only really at its best – be it solo or in multiplayer – when two characters have the same type of weapon. It’s been around five minutes since you last read about a Metroidvania game, so judging by my watch that means it’s probably time for another one. 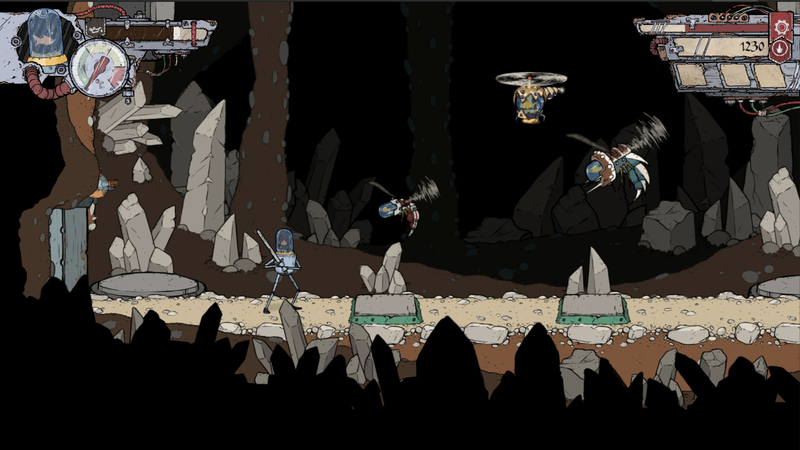 Feudal Alloy puts you in the metallic feet of Attu, a medieval robot who’s controlled by a fish that swims around in a tank in its head. After a bunch of outlaws ransacks his village, burns his house down and steals the town’s oil supplies, Alloy decides to head out, rusty old sword in tow, to find them and dish out some robo-justice. Don’t worry about any of that, though: this is all just an excuse to explore yet another large area filled with a bunch of smaller rooms, some of which can’t be accessed until you get new skills later in the game. It looks nice enough – going down the hand-drawn look instead of the 8-bit or 16-bit look means it feels a little less generic – and the music’s fine too. But it’s just… I don’t know. There are just so many of these games now, you know? It’s not without its flaws. In the early few hours enemies can take a little too long to kill: this leads to you taking frustrating levels of damage as a result, and makes combat feel unsatisfying. It doesn’t really feel like your battling enemies, more chipping away at them with a spoon. Checkpoints are a tad too far apart too, meaning when you die (which you will) you’ll find yourself retracing your steps too often. The result is a game that is by no means the best of its genre, but is perfectly harmless in every way. And yet, there are so many others on the Switch that I would only really say “get this” if you’ve already played through, say, Hollow Knight. Or Dead Cells. Or Gris. Or Axiom Verge. 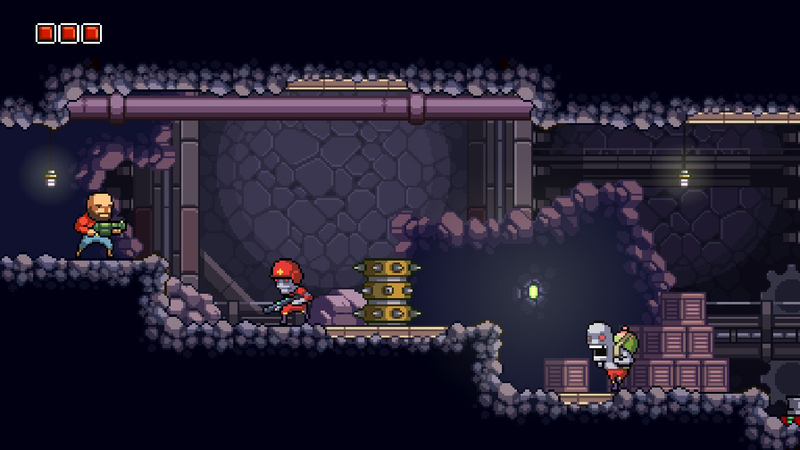 Or SteamWorld Dig 2. Or The Mummy Demastered. Or Yoku’s Island Express. Or Bloodstained. Or Guacamelee. Last up is this odd survival game developed by German studio Mad About Pandas. 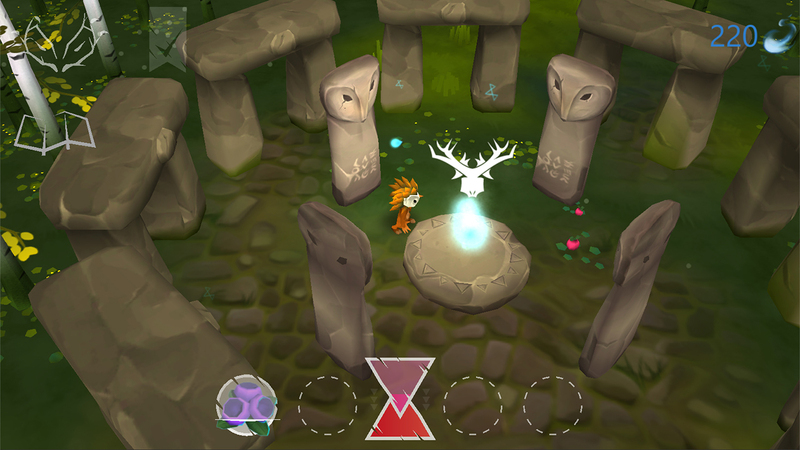 Forever Forest has you exploring a massive woodland area as a small masked creature. You have to head north, lighting up the various temples you come across in order to illuminate the entire forest. As you do this you’ll encounter progressively more difficult enemies, but you can attack them and take their horns, which can then be traded at shrines for new abilities and upgrades. It’s a simple idea, but it can take a while to get used to. Its is a bit of a mixed bag: it’s minimalist enough to leave you trying to figure out what to do next, while at the same time the menus are clunky enough to take a little too long to adapt to. 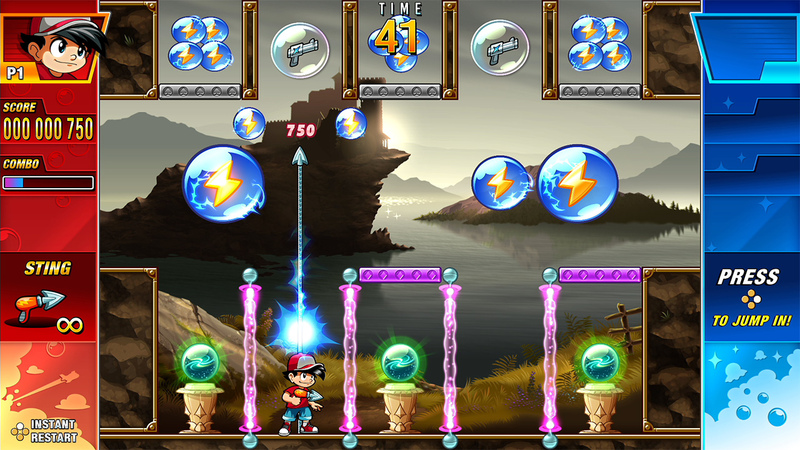 Meanwhile, although the actual game itself is easy enough to play – you have one main rolling pounce that doubles as both your attack and an evasive move – other elements, like the power-ups you can collect and activate, can be confusing. It doesn’t help that the game regularly stutters and can be pretty bloody glitchy in general. I spent my first 40 minutes completely stuck until I realised the fact I couldn’t get into the first temple at the beginning of the game was down to a weird bug blocking my entry. After restarting the game I wandered in with no problems. Forever Forest looks atmospheric and definitely gets points for artistic merit, but its deliberately vague nature makes playing it confusing at times, and when you do know what’s going on the performance issues are constantly irritating. Much as I like its style, this is one forest I sadly don’t see myself playing through forever. Review code for each game was provided by PRs. The opinions in my reviews are in no way influenced by how I received the games. I appreciate Metroidvania games a lot. It has been a great time for the genre. I have played all the games that you had referenced. Although, Monster Boy was my favorite. And I can’t wait to play Bloodstained: Ritual of the Night. I will definitely take a look in those two titles of your list.